Pansies are flowering annuals that prefer life on the cool side. They are the first choice of both professionals and home gardeners from all over the US for use in providing vibrant splashes of flower color in the winter landscape. In what otherwise would be a drab, dormant winter landscape, pansies are there with their bright colors and cute smiling faces to put a smile on our own faces. 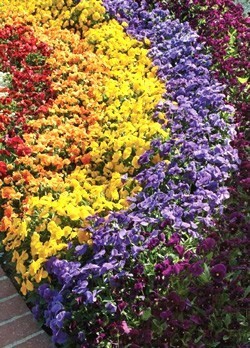 There are many, many series of pansies available on the market today, and many varieties (colors) within each series. 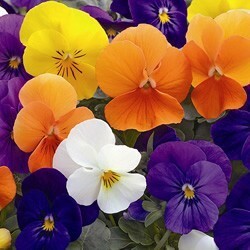 Each series of Pansies has it's attributes and/or it's strengths or weaknesses. Some are more tolerant of the extreme cold temperatures, and are better for use in northern regions of the country, while others have demonstrated better tolerance to the warmer winters down South. Some produce smaller flowers while other produce larger flowers. Some have "faces" (blotches), or are bi- or tri-color, while others are solid, single color. Some have a more bushy growth habit while others are trailing or spreading...I've yet to find a trailing series that really does well in flowerbeds in the South, though have had success with these in containers and hanging baskets. Since the early 1980's, I've planted and grown literally millions of pansies in my own landscape, as well as in the landscapes of thousands of clients. Since 1989, I've also closely monitored massive amounts of feedback from thousands of customers who've shopped at our retail nursery and garden center in McDonough, Georgia. Rather than list all the series of pansies available on the market today, or that have come and gone over the years due their incompatability with the southern climate and environment, below is a list of the one's which have demonstrated the best overall performermance in flowerbeds and container gardens in southern landscapes. I've had more success with the Matrix Series pansies than any other series in the past or present. If you haven’t discovered the truth about the Matrix Series pansies, it’s time to take yourself off “pansy autopilot” - buying and planting other varieties - and find out how Matrix can give you the color show you desire in your flowerbeds and container gardens. As some of us in the South know, in fall conditions, which is when we are planting and which can be warm, pansies can stretch (become leggy). But Matrix Pansies are different. They grow outward first to cover the soil before initiating blooms, without stretching. Short, strong branches hold up the large, thick flowers on plants that grow to about 6-8 inches in height with an equal spread. All of this means a more bushy plant with more flower power. And that's what we're looking for! With pansies, a strong root system is important, expecially in warmer regions. The vigorous root system apparent in each of the Matrix varieties (colors) means your plants will take up water and nutrients better and more uniformly. The stronger root system ensures strong plants that are less prone to disease. Matrix pansies were bred with 3 specifics in mind – root development, branching, and bloom power. Pull a nice Matrix pansy out of the pak it was grown in and you'll notice the abundance of vigorous white roots. From the start the foliage branches from the bottom up creating a sturdier, fatter plant that holds its height and fills in fast. Then 2.5-3” blooms pop on stocky, short stems that hold the flower in a pleasing forward-facing position. Top all this off with a wide range of clear and blotched faced colors, plus an excellent over-wintering habit, too. 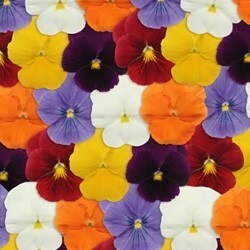 No doubt about it, Matrix is the only pansy for the Southeastern plant market place and your gardens! 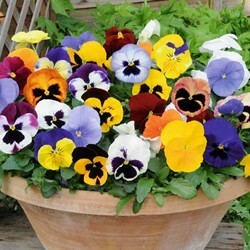 I've had great success with the Panola Series pansies in both flowerbeds and container gardens. The colorful, early-blooming plants stretch less in heat than other pansies. Flowers are a little smaller - I'd say they're mid-size - but plants have exceptional flower power: what they lack in size they make up for in number! There are 24 colors and 10 mixes in the Panola Series to choose from, though it's doubtful you'll find every variety and mix at any single location nursery and garden center. Just get what they got of these great pansies and be happy! Panola pansies deliver uniform flowering and plant shape across every color, so there is no need to pick and choose from several series to get high-appeal, low-maintenance performance. All varieties grow to about 6-8 inches in height with up to twice that in spread. I space them about 6-8 inches apart in flowerbeds and 4-6 inches apart in containers. The more sun you can give them the better however the Panola have demonstrated exceptional shade tolerance in my landscape; thriving in as little as 3 to 4 hours of sun per day (morning sun is best to dry dew from the leaves). With the exception of their top rival: Matrix Pansies, nothing adds more vibrant color to coolseason projects than mass plantings of bright Panola pansies and they're great in containers, too. Try mixing Matrix and Panola for a stunning effect! As with Pansies, there are several popular series of Viola on the market today. Within each series there are many varieties (colors). All violas are similar in that their flower size is considerably smaller than the average pansy (about one-third the size). But, over the years, I've found that there's one series of viola that has consistently performed better in the South (maybe everywhere?) than any others. This is the Penny Series. Penny Series violas are the number one selling viola for good reason. The Penny series, which includes many different colors, boasts the vigor and flower power gardeners in the South are looking for. They have larger than normal viola-sized blooms that proliferate over lush green, compact foliage, and perform better than any other viola I've trialed. With a height and spread of 4-6 inches, Pennys have multiple uses for bedding, landscape and containers. The more sun you can give them the better however they do great in morning sun with afternoon shade in my landscape.